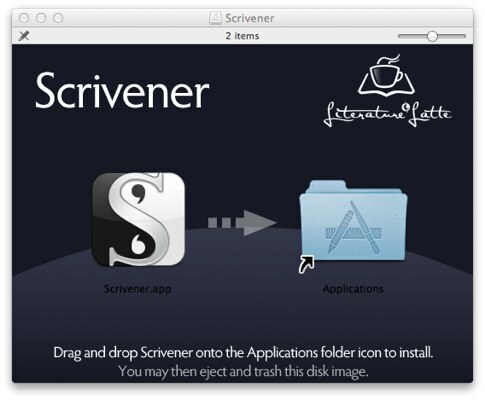 If you have purchased Scrivener from the Mac App Store, please refer to these instructions. This article pertains to installing the demo, or installing and registering the software for direct sales only. Download Scrivener from the main product page. You will need to select a version appropriate to your system. There is one version for 10.4 (Tiger) and 10.5 (Leopard), and another version for all systems running 10.6 (Snow Leopard) or newer. The file that downloads is entitled "Scrivener.dmg" or "Scrivener-Legacy.dmg", depending on which version you chose. This is a Disk Image (a virtual disk) containing the program, and not the program itself. Depending on your browser settings, the disk image may open automatically once it finishes downloading. Otherwise, double-click on the DMG in the folder to which you downloaded it. 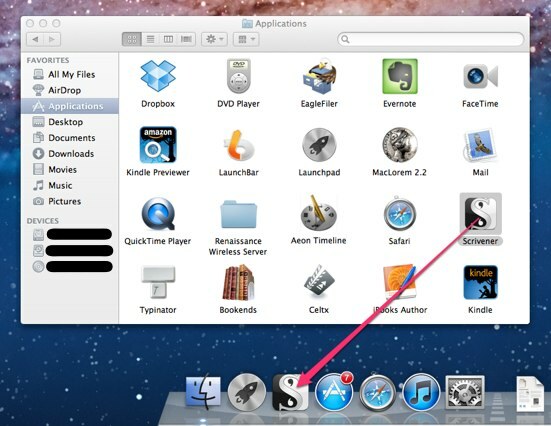 You may also, if you prefer, drag the icon to your personal Applications folder rather than the system folder. This can be a useful option when you do not have administrative access to the machine. If this is the first time you have launched Scrivener, you will be informed that it is the trial version and that it will expire after 30 days. If you wish to use the trial, just click "OK". If you have purchased a serial number, you can click on the “Enter Licence” button and enter your name and serial number (alternatively, when Scrivener is running, you can go to Scrivener > Register... to enter your serial number). This will unlock Scrivener so that it becomes the full, unlimited version. For Registered Users: if you have already registered Scrivener on this Mac account then you will not see the trial version message. 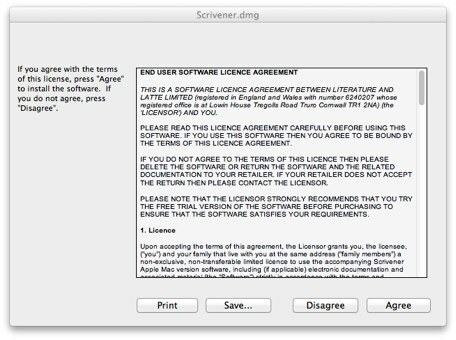 Scrivener will simply continue to run unlocked, as it did when it was installed last.